Great Activities for all ages! 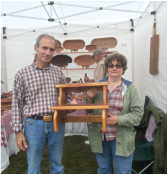 Members of Hottel Keller Memorial Inc., the sponsor organization for GermanFest and the Shenandoah Germanic Heritage Museum will have various items for sale at their booth. They will help visitors with their questions. Some members may explain the Hottel Antique Loom located in the Loom Room on the back of the Keller House. While the house is presently a private residence, it does date to the early 1800’s, and it was originally configured in the typical Shenandoah Germanic design. Other additions and some white siding disguise the original logs. Peek in the Summer Kitchen, which is located underneath the Loom House, and ask the docent to explain the use of a summer kitchen and the reason there is a water trough inside. The Loom Room and the Summer Kitchen make up the main body of the Shenandoah Germanic Heritage Museum. But in a sense, the entire farm is a museum. Grab a ride on the “People Carrier” and examine the ruins of the George Hottel House. You can see the picture of the house, before it burned, on the monument. The central limestone chimney and part of the stone foundation help explain the layout of the original part of the house. The George Hottel House was built in the mid 1700’s. The huge Hottel Chimney is an example of the typical Germanic central chimney. A close look reveals the holes for jamb stoves. Those were another typical Germanic feature. Docent Joyce Hamrick lived in the Hottel House, and she will bring her picture album! She will be assisted by Docent Gloria Kronk. While on the Hottel side, stand at the left doorway of the old Hottel Spring House. The original log structure was built as early as the old house. Peer in the door on the left and imagine the women doing the laundry by hand. They are using their big old tubs. They have heated the water in the fire place. Or maybe they are making soap today. They could be cooking something! Massanutten Tractor Club will be a sponsor again for GermanFest 2015. 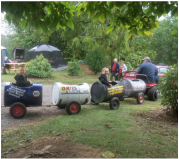 The tractor club will provide a barrel train for the children, and their people carrier will be available to take people from one part of GermanFest to another. Club members have some wonderful machines – including one tractor that has remained in the Hollar family and was purchased from William Jacob Keller, Sr. - the owner of the Keller Farm in the early 1900’s. William Jacob Keller was the first John Deere dealer in Shenandoah County. Sue Ober will demonstrate sewing quilt pieces on an antique hand-cranked sewing machine. The ever faithful members of A Basket Case are always teaching and learning basket techniques. They will have some of their old favorites and their latest basket designs. Don Ober, the farrier, will be shoeing horses and talking about his skills. Dewey Baker, a representative of the Shenandoah Valley Blacksmith Guild is preparing his hammers and cleaning up his anvil for one of his terrific demonstrations! Mr. Baker is a good teacher, and his love for his occupation shows! The Shenandoah Valley Battlefield Foundation and The Newtown History Center will be on hand with information on their areas of historic expertise. Terry Header from the Battlefield office in New Market has a new headquarters to talk about! Ask Wayne Eldred about the Newtown Wagon and projects going on around Stephen City (Newtown). The Humane Society of Shenandoah County will also be on hand with brochures and sale items. Stop by their booth and purchase something fun for yourself or your pet. Communications for GermanFest will be handled this year by The Woodstock Amateur Radio Group. The group president, Larry Miller, will help coordinate between various activities spread across the large Hottel Keller Farm. The Shenandoah County Historical Society volunteers will bring their knowledge of local history and their large supply of books to sell. The Harrisonburg Rockingham County Historical Society will attend as well, bringing materials relating to Rockingham County. Jeff Driscoll, ranger from the Cedar Creek Battlefield & Belle Grove National Historical Park will explain how the farm was affected by the battle. The western part of the battlefield extended over the farm, and there were cavalry and cannons on the site. We will also remember how "The Burning" affected the farm. Confederate soldiers and others will help to explain the losses the Keller family sustained. Several Civil War groups have been invited. John Adamson will have a display of his original long rifles and will gladly answer questions pertaining to them. 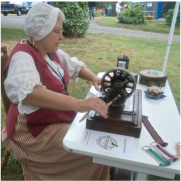 1st Saturday Spinners will be spinning wool into yarn on various types of spinning wheels. 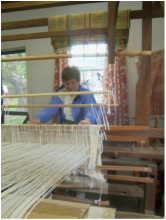 Some of them will be weaving on the Hottel loom and other smaller looms. The Germanna Foundation will be bringing an exhibit on the Germanna colonists who came under the sponsorship of Governor Spotswood in 1714 and 1717 to the frontier of Spotsylvania County, Virginia. Some families in the Shenandoah Valley trace their origins to these colonists. Shenandoah County Library - Shenandoah Room and Truban Archives.